Weedcamping. It was destined to become a verb in the full-time RVing community. With marijuana legalization sweeping the nation, the cannabis marijuana plant harvest has joined the ranks of short term but lucrative seasonal workamping jobs such as the sugar beet harvest workers and Amazon warehouse fulfillment staffing. Interested? Here’s what you need to know to apply for jobs. Workers are in demand for weedcamping harvest jobs. Even before it became legal in most states, each fall thousands of “trimmigrants” would flock to marijuana growing regions like Northern California and Oregon. They came for the annual cannabis harvest. Young and old, they arrived in droves to harvest mature cannabis plant buds and prepare them for market. Back then the harvest and its related subculture of migrant workers was always under wraps in mainstream society. But now that marijuana legalization has occurred in most states, even your everyday full-time RVer is profiting from industry growth. In a legal marijuana world, today’s modern marijuana growers are struggling to fill a growing market demand. They’re reaching out to a broader workforce that includes full-time RVers. Their efforts to find marijuana harvest workers are displayed in mainstream publications like Workamper News. Legit marijuana producers advertise in mainstream workamping magazine. Many in the full-time RVing community have dubbed this line of work “Weedcamping” and they’re expressing an interest in joining the boom. “I did the potato sugar beet harvest last year received a 100lbs of potatoes. Wonder what the weed harvest bonus is?” — Les B.
Snickering aside, the industry is legit and now hiring. 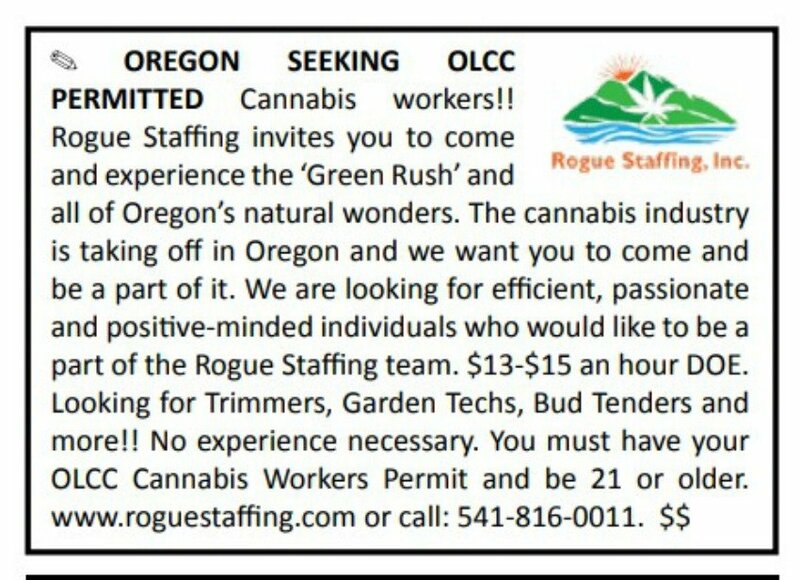 “We place people in a variety of positions including supply chain, operations, packaging, trimmers, warehouse, administrative, bud tenders, IT professional, marketing, packaging and every other area of the cannabis industry,” announces the Rogue Staffing company that fills jobs for Oregon’s marijuana producers. Marijuana harvest workers must pay $100 for a handling permit. 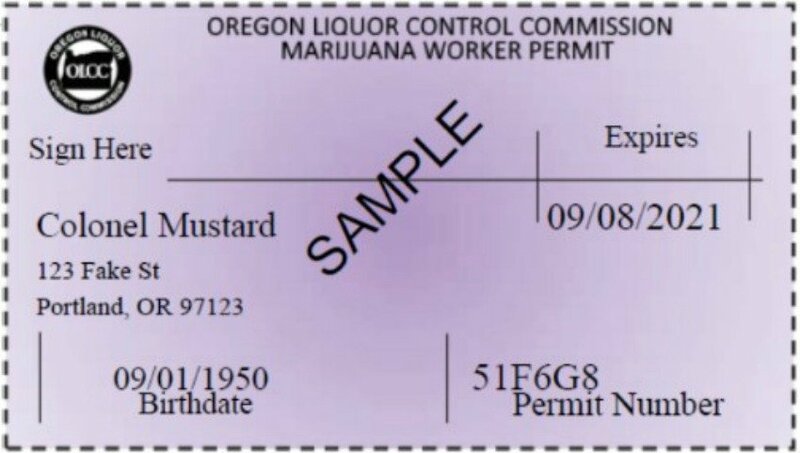 In places like Oregon workers must pay the $100 fee to obtain a handling license. The profitable “green rush” has some drawbacks as a result. Marijuana producers don’t usually don’t offer full-hookup campsites the way more traditional workamping employers do. Many RVing trimmigrants are experiencing housing shortages in fertile growing regions as a consequence. “Our challenge was finding a long term RV park that had vacancy,” writes Nicole S. in a Facebook group for work campers. The fall harvest that begins in September and concludes in early November. Those interested in applying for this line of work on the road should have their RV park accommodations arranged well in advance. Newly marijuana-legal states like California are currently writing laws to accommodate a legalized annual marijuana harvest season. More jobs for full-time RVers and nomads are certain to follow by next year. You are one clever dude, your gray but you are probably only a few years over 50 like me I guess. I would like to do this for the summer and winter down in Mexico to fish and save money. I hope your doing well , let me know whats up and if your doing ok.
Gonzo out? onward thru the fog…. I am very interested and would love to do this in Colorado or Oregon . Whom do I contact to get the education or license test fees. can I make CBD oil ? About every other sentence was the word legal. It is still against Federal law. Just sayin. You can be charged with a federal crime. So I would not rush out to do this work. The industry could afford to pay more. Who can live on those wages? I don’t think it is such a great idea to get the whole world high on weed. Of course it is better than hard drugs. I smoke weed and hash since 18 years old. I am almost 70 now. I live in the Spanish mountains on my farm and in perfect health, but I smoke minuscule amounts and not often. When I feel the ganja entity is taking over, I throw the remainder in the barranco and don’t smoke for half a year. When young I backpacked through Afghanistan and got very high. Incredible beautiful and magic country! Now it is all fucked up by Russia and USA. About 60km from where I live is a big travellerscamp. They are high 24/7. They are all very vain and conceited. When you see their “art” in the shops and so called “galeries” in the local town, it is like straight out of a psychiatric clinic. For medicinal and religious purposes I think ganja is ok. But being stoned 24/7 destroys your brain. Don’t smoke like a pig. It is an insult to the ganja goddess. My concern is that a worker may end up on a secret or semi-secret watch list, then get hassled by the various authorities as they travel. Just remember: Big Brother IS Watching. I think it’s criminal that if your on social security, which you paid for, that your penalized if you continue to work. The government needs to stop this practice or else privatize it so your contributions are invested and you can access it at retirement age yet still continue to work. The article states that marijuana is legal for use in most states, this is not accurate in my opinion. 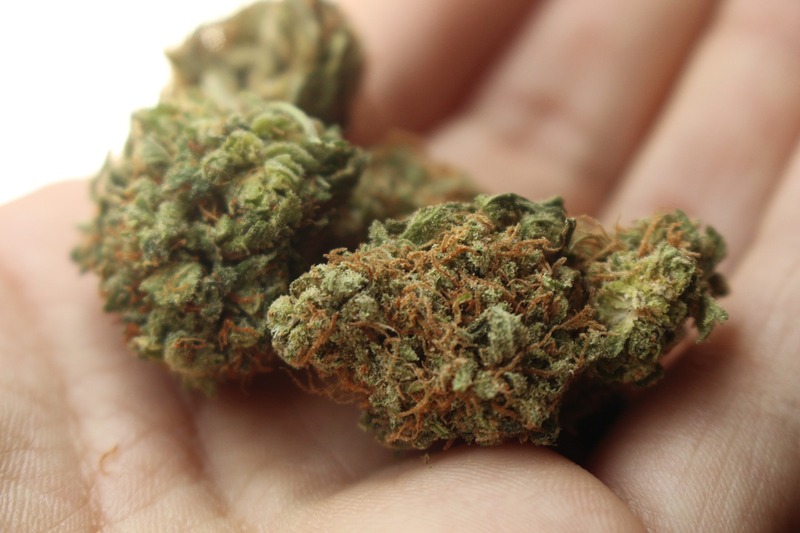 First it is only legal for recreational use in 8 states, second 21 states allow its use for medicinal purposes only and some of the 21 do not allow it to be smoked. I guess if you consider over half being most then do be it but I truly look at it as only 8. All said and done it is not legal on a federal level either. Now if you are under the influence of it and in a accident you will most likely be charged at fault. (Just like alcohol!) if you have a CDL and are found under the influence of either drugs or alcohol (meaning it is in your system with a blood test, you most probably will lose your CDL. CDL drivers have a zero tolerance per federal laws. Just an FYI. Personally I think it would be an insult to ask me to pay a $100.00 for a permit so I can work two months for $10.00-$15.00 an hour. Probably make better than that picking up cans out of the trash for recycling and no permit needed. By the time you pay your camp fees and fuel you will be upside down. My time is worth more than that. All you are doing is putting a healthy profit in the grower and sellers pocket at your expense. Good luck with that!